Buskro Ltd (Toronto, Canada) designs and manufactures a full line of innovative inkjet imaging equipment to meet a broad range of variable data printing (VDP) requirements, from single printhead addressing to multiple print head form and transaction applications. Complementing this equipment is a comprehensive line of high precision transport bases, feeders, conveyors, and extension tables, as well as our industry-leading smart tabbing/labeling systems. We take pride in providing quality service and support. Buskro service technicians working from offices in the Canada and the US work alongside our global network of factory trained dealers to support our customers around the world. Buskro is interested to engage in communication with an established business who would be interested in becoming a Buskro Dealer/Distributor in France/Belgium. Buskro’s Card Personalization System or CPS is the latest addition to Buskro’s complete line. 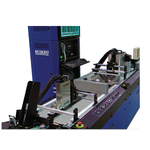 The CPS is a fully-integrated, purpose-built solution, designed specifically for the plastic card personalization industry. The CPS is comprised of four main elements: Buskro’s powerful and proven Compose IQ software package; our complete family of inkjet printing solutions; our most recent innovations; Buskro’s MRW high-speed, magnetic, stripe writing and verification unit; and the modular MTS transport system.